This vegetable soup is HUUUUGE! Why? Because it can be anything! 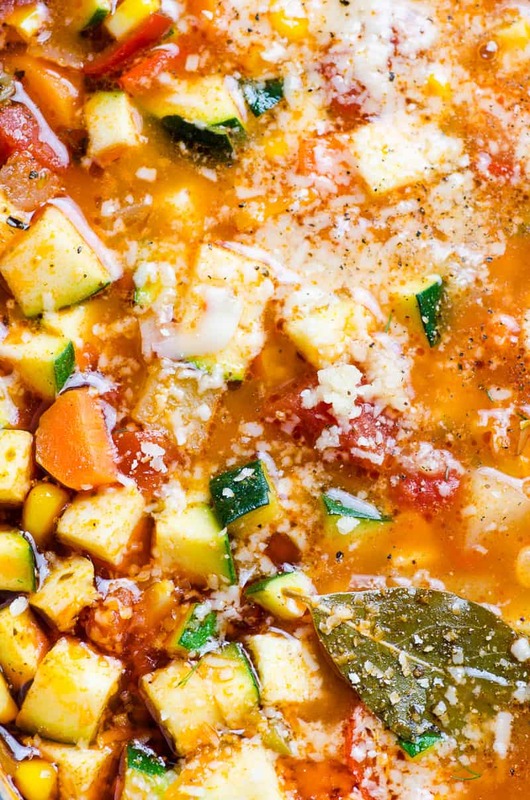 Wanna call it diet or detox veggie soup? 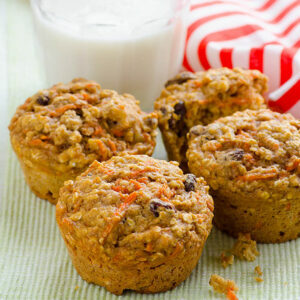 Go for it because it is loaded with fiber, belly filling liquids and flavor. Basically, this is internet world’s best vegan vegetable soup! As I always say, everyone has their own definition of “healthy”. Here is my take on vegetarian soup. Loaded with vegetables. Everyone needs to eat more vegetables. Eating more veggies cannot be bad. Great source of many essential vitamins and nutrients. For example, vitamin A in carrots and vitamin C in tomatoes. 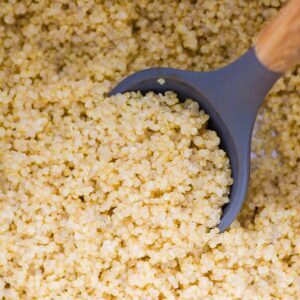 Low in calories and high in fiber to keep you satiated for long period of time. No BPA and low in sodium unlike canned soup. You control the quality of ingredients. We treat soup as a main meal. 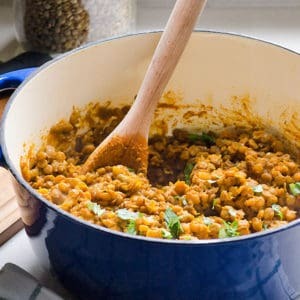 It is dinner 99% of the times because it is fast, easy, healthy, cheap and filling. I grew up in Ukraine eating healthy soups every-single-day. Now living in Canada I still cook it at least 3 times a week. My tip for you, besides falling in love with “soup for dinner” concept, is to buy wide deep plates the rest of the world uses for pasta and use for soup. It cools off faster (huge for kids) and prevents running to the stove refilling the cereal bowl about 3 times. That’s how we used to roll until I bought these 8 Corelle plates. 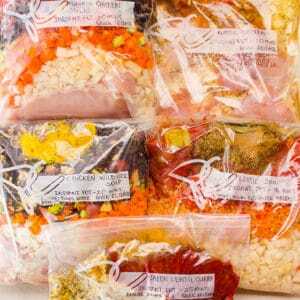 Want to make it with abundance of organic garden or mixed frozen vegetables? 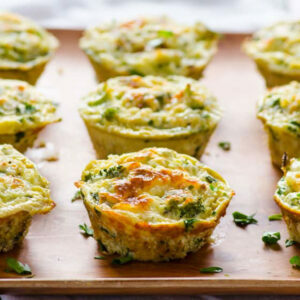 Fridge raid? Go for it! This homemade vegetable soup can stand whatever life throws at you. Including going bad zucchini in a veggie drawer. Of course. Vegetables like peas, carrots, green beans, corn, bell pepper, squash, cauliflower and potato work. Any vegetable will work. I often use this soup as a fridge and freezer clean out. Everything but kitchen sink. Do not question every step you make when cooking. Do what works for you. Do not think how it should be. If it tastes good for you, then it is a good soup. That is how eating healthy becomes easy. How Many Calories and Carbs? 2 cups of mixed vegetable soup contains about 230 calories. This soup will fill you up with good for you carbs and you will not need a slice of bread. Buns are for the boys. 2 cups contain 47 grams of carbs. Good for you carbs. Please do not confuse white pasta simple carbs with whole foods complex carbs. Last one offers more health benefits than the first one. 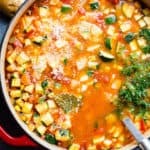 How to Season Vegan Vegetable Soup? Fresh dill or garlic at the end. 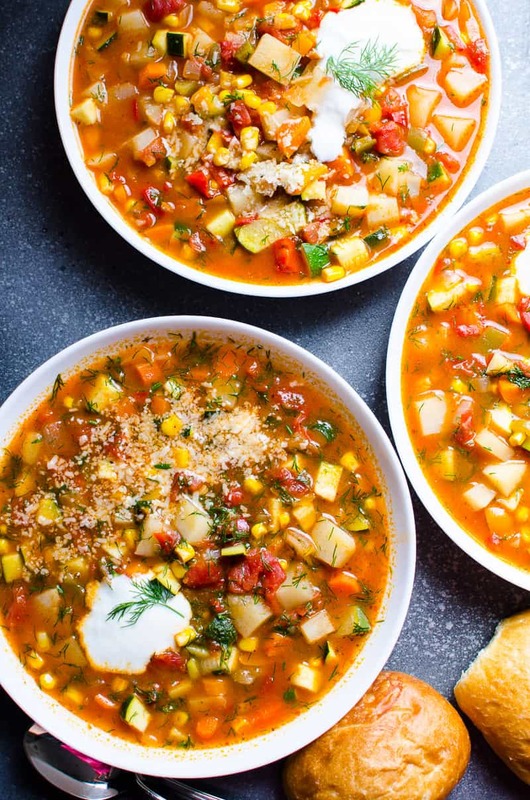 Easy vegetable soup is perfect for summer. During hot months I like to simmer it on a stove for 30 minutes or until vegetables are tender. This method results in crunchy vegetables and lighter soup. Although kitchen feels warmer. In winter, I prefer thick and hearty consistency soup. And below are 2 methods I use. 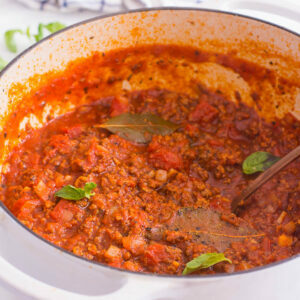 Add all ingredients + 6 oz can tomato paste to a large crock pot. Add all ingredients + 6 oz can tomato paste to Instant Pot. Release pressure using Quick Release. 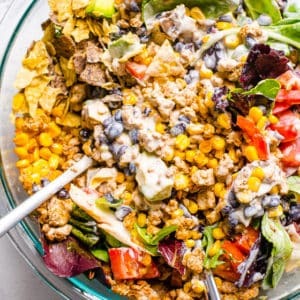 Tip: Instant Pot and slow cooker should not be overlooked during summer. 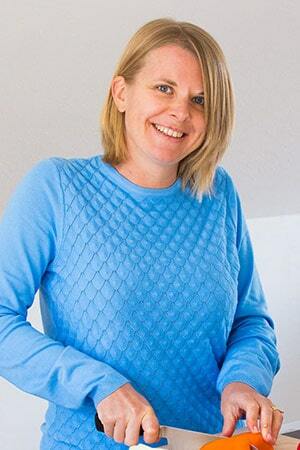 Place slow cooker or release steam on pressure cooker outside and your kitchen stays cool. Refrigerate for maximum 2 days. I find longer than that vegetables become too mushy. If this recipe is too much for your family follow the next step. Yes. I recommend to freeze soup right after cooking. 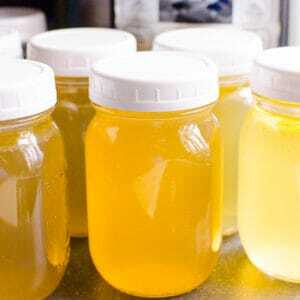 Transfer to an airtight glass container and freeze as soon as soup has cooled down. Or freeze leftovers as soon as after day 1. Later vegetables become more mushy sitting in liquid. How to Thicken Veggie Soup? If you want more hearty and thick soup, insert an immersion blender right in the pot. Pulse a few times until it is thick as you like. Yes. To cook soup with cabbage, add thinly shredded cabbage 15 minutes before other ingredients. 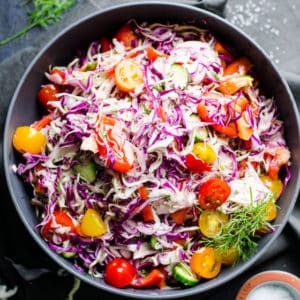 Cabbage is a vegetable with tough fibers. It takes a bit longer to cook. You might think it is a funny question. It is not. In Ukraine, where I grew up, all dogs and cats ate real food. There was no processed pet food. All animals ate our food and leftovers from the table. Fresh Vegetables. Use any combination of frozen vegetables. For example, peas, carrots, green beans, corn, bell pepper, squash, cauliflower, potato. Any vegetable will work. Broth. In place of vegetable broth, use low sodium chicken broth or beef broth. If you are not strict vegetarian or vegan. Dried Oregano. 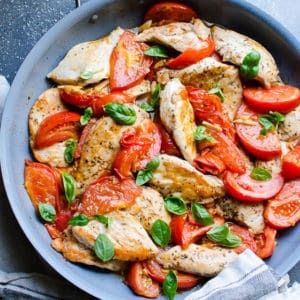 Substitute dried oregano with dried basil or Italian seasoning. 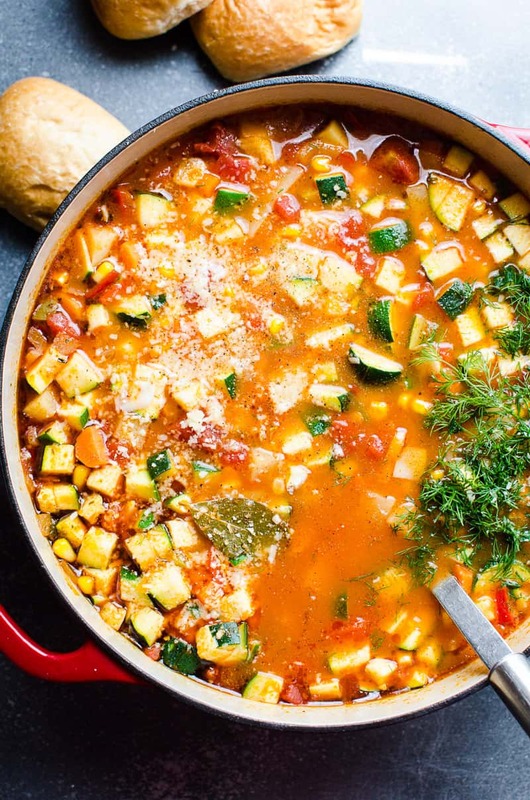 How to Make Vegetable Soup with Fresh Tomatoes. Instead of canned diced tomatoes I love to use fresh tomatoes. When they are in season August – September. Dice 1 lb of tomatoes and add with other ingredients. I love fresh tomato vegetable soup! Tomatoes fall apart and soup tastes very good with garlic and yogurt or sour cream. Yum. What Goes Well with Mixed Vegetable Soup? Toast whole grain bread or buy fresh rye bread or baguette. OMG YUM!!! 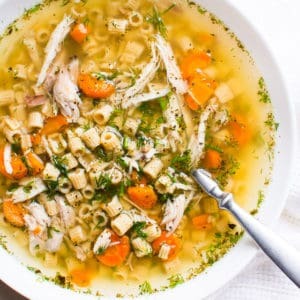 Instant Pot chicken noodle soup – is there any other soup that’s more comforting?! 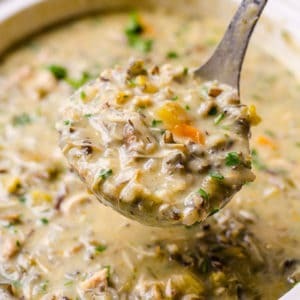 Healthy chicken wild rice soup so creamy without any cream! Spinach lentil soup from my Italian neighbour. Healthy broccoli cheese soup that is bright yellow from overload of vegetables. 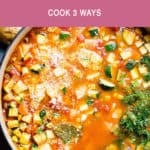 How to make easy and healthy homemade vegetable soup with mixed fresh or frozen vegetables and simple seasoning on the stove, Instant Pot or slow cooker. Preheat large dutch oven or large pot on medium heat, swirl a bit of oil to coat and add onion. Cook for 3 minutes, stirring occasionally. Add smoked paprika, oregano, garlic powder, salt, pepper and bay leaves; cook for 1 more minute, stirring frequently. Add potato, carrot, celery, pepper, stock and diced tomatoes; stir and cover. 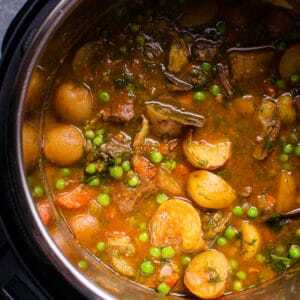 Bring to a boil, reduce heat to low and simmer for 25 minutes or until potato is fork tender. Add zucchini and corn, cover and simmer for 5 more minutes. Turn off heat, add garlic and dill. Serve hot garnished with Parmesan cheese and yogurt. 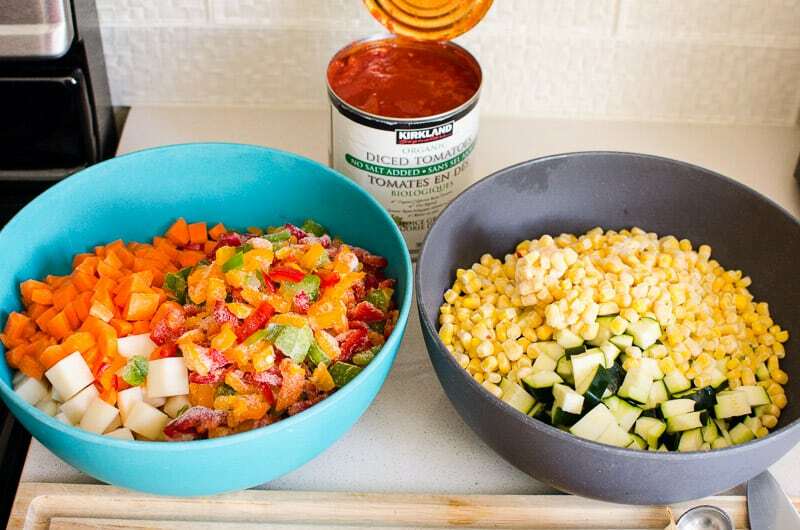 Add a 6 oz can of tomato paste and skip zucchini. 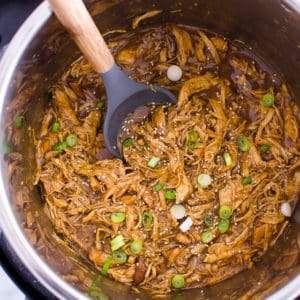 In a large slow cooker, combine all ingredients, cover and cook on Low for 10 hours or on High for 5 hours. Add garlic and dill (parsley); serve hot with a dollop of plain yogurt. Add a 6 oz can of tomato paste. 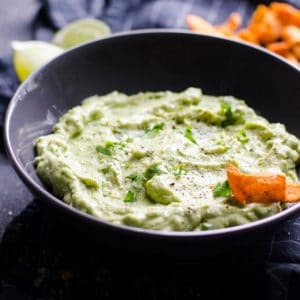 In Instant Pot, add all ingredients in the order listed above except zucchini, dill, cheese and yogurt. Pressure cooker shouldn’t be more than 2/3 full. Close the lid, set pressure vent to Sealing and press Pressure Cooking on High for 20 minutes. Display will say ON, Instant Pot will take about 30 minutes to come to pressure, you will see a bit of steam coming out from a valve, then float valve will rise and countdown from 20 minutes will begin. After display beeps and says OFF, do Quick Release by turning pressure valve to Venting position, which takes 3-4 minutes. I recommend doing so outside to avoid the mess and smell. Open, add zucchini, close the lid and let sit for 5 minutes. I used low sodium broth and diced tomatoes, so if yours is not then add less salt to taste. Smoked paprika is the secret ingredient that makes soup super flavourful, and then Parmesan cheese of course, and dill and fresh garlic. It’s a combo. But I definitely wouldn’t trade it for regular paprika.